Golfing leadfoot Rory McIlroy plans to slam his foot on the accelerator and chase down leader Ross Fisher in the race for 3 Irish Open glory. The Holywood hotshot, 21, trails the big-hitting Englishman by five shots after a rollercoaster 68 left him in a nine-way tie for third with Irish aces Padraig Harrington and Michael Hoey on seven under. And after watching Fisher blast a career-best 61 to grab a three shot lead over Italian stallion Francesco Molinari, he knows he must unleash his power and go low today. 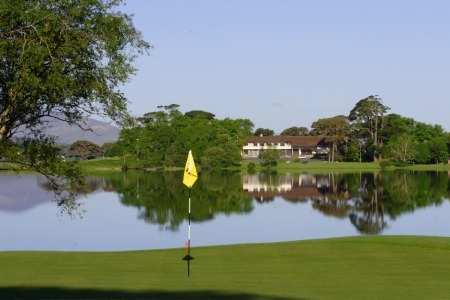 Fisher’s record round showed that Killarney’s Killeen course is vulnerable to the big hitters and McIlroy knows he can let loose with the driver and avoid serious punishment. He said: “It is easy to get away with certain things and that is the nature of this golf course. It could be different on a certain week. “You knew going out that you can hit driver and you can sort of give it a rip because even if you let yourself get out of position on some holes, it’s not too bad. McIlroy had six birdies and three frustrating bogeys in his 68 with the highlight of his round coming at the 13th, where he hit a wild drive but chipped in from more than 30 yards for birdie. While birdied the par five 16th to move to within two shots of his 10 under target, he bogeyed the next and knows he can’t afford many more mistakes. He said: “It was quite frustrating to be honest. It seemed like every time I made a birdie, I made a bogey and it sort of halted me in my tracks. “But I’m only five back going into tomorrow. It all really depends on what Ross does to be honest. I think the guys chasing him just have to concentrate on their own game and try to get off to the best start possible just to putt a little bit of pressure on them. “I probably just a few too many mistakes out there. I’ll have to really try and limit those for the weekend, because I feel as if I’m playing well enough to really challenge this weekend. Darren Clarke hit a frustrating 70 to slip six shots off the pace but after a birdie at the last he’s not throwing in the towel. Ready to reel in Fisher, Clarke said: “There’s still another 36 holes to go, and there’s a bunch of players on seven-under all trying to catch him and a bunch of players on six-under. “I struggled with the pace of the greens and when we got the rain on top of it as well they slowed up a bit more and I didn’t adapt. Paul McGinley had seven birdies in second successive 68 to join fellow Ryder Cup vice-captain Clarke on six under. Damian Mooney (71) and Gareth Maybin (72), missed the level par cut by a shot with David Higgins (72) on two over and Peter Lawrie (73) and Simon Thornton (74) taking three shots too many. Padraig Harrington and Rory McIlroy are hoping that home advantage will help them chase down big-htting Ross Fisher in the 3 Irish Open. Rory McIlroy hopes for better things in the Irish Open this year. 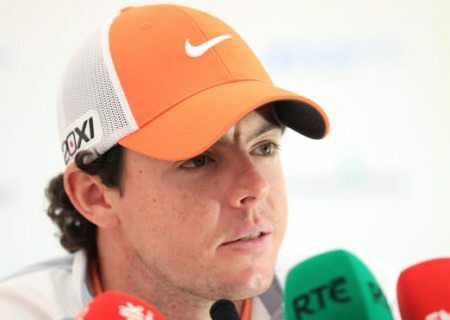 Photo Fran Caffrey/www.golffile.ieTennis lover Rory McIlroy is determined to avoid a double fault in Killarney and smash his way to Irish Open glory. With Darren Clarke and Padraig Harrington missing the cut, a damp squib weekend was on the cards if the other major winners failed to ignite. But McIlroy made a late charge to shoot 67 and G-Mac weighed in with a sizzling 66 to get within six shots of leader Marcel Siem (66) on four under par.